Summary: Angela Pisel’s poignant debut explores the complex relationship between a mother and a daughter, and their quest to discover the truth and whether or not love can prevail—even from behind bars. It wasn't until I saw so many Facebook ads for the new novel WITH LOVE FROM THE INSIDE by Angela Pisel that I realized I had this book sitting on my shelf. That could tell you a few things about me... 1) that I have no idea what books I have, or 2) that I have a lot of books on my shelf. Both are probably a little bit true. WITH LOVE FROM THE INSIDE tells the story of a very difficult relationship between a mother and daughter. Grace is the mother and she has been living on death row in a prison for years for killing her infant son. Her daughter, Sophie, is happily married to a successful doctor, lives in a beautiful home... and hasn't spoken to her mother for over a decade. She is also living a lie because she's never told her husband the truth about her mother. Grace is desperate for her daughter's forgiveness especially now that she's run out of appeals and has been given the date of her execution. When she returns back to her hometown for some closure, she discovers some new evidence about her baby brother's death. This new information could be exactly what Sophie needs to prove Grace's innocence. Sophie isn't sure what to make of the past seventeen years. She remembers her mom as a kind, loving mother, but she also knows that the evidence of the baby's death points directly to Grace. She also knows that by telling her husband the truth about her mother after all of these years could put her marriage in jeopardy. Sophie must decide quickly what she wants to do... before it's too late! 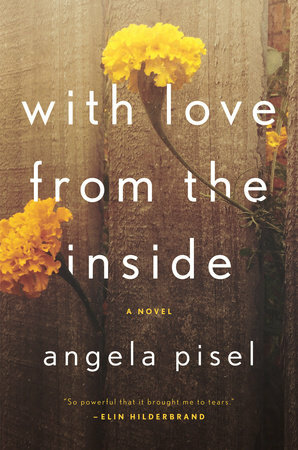 I really enjoyed WITH LOVE FROM THE INSIDE, and I was definitely impressed with the debut effort by Ms. Pisel. The novel was a compelling story about a mother and daughter that really touched my heart. I appreciated that there was a touch of a mystery surrounding the death of the baby, and I liked how the secrets were resolved. I think the strength of this novel was the relationship between Grace and Sophie... even though they weren't really together in many of the scenes. The book alternated between the two women and much of Grace's chapters were letters written to Sophie. As Grace remembered her time bringing up Sophie, I found my heart aching for her. She was obviously a woman of faith who loved her child dearly. She was so concerned with leaving behind her memories and words of wisdom to her daughter. I was actually surprised by how much I felt while reading this novel. I think that's a testament to the author and the characters she created. I found both Grace and Sophie to be interesting, and I definitely liked both of them too. As the story went on, I found my heart just breaking for both of them -- Sophie because she was so damaged and living a lie and Grace because she was sentenced to death and living in prison. These women were suffering so much and it seemed like neither one was to blame. I don't want to give too much away, but I will say that I appreciated the ending of the story. I don't know that I'll go so far as to say I liked it though. I appreciated it because it fit with the novel. (That will make more sense if you read the book.) The ending wasn't entirely predictable and it did make me think (which is a very good thing); however, it wasn't entirely the resolution I wanted! I do think WITH LOVE FROM THE INSIDE would make a great book club pick. There is a reading guide available with eight thought-provoking questions. Some of the themes you might want to explore include mother/daughter relationships, guilt, secrets, lies, our legal system, the death penalty, and forgiveness. Overall, I thought WITH LOVE FROM THE INSIDE is a compelling novel about a very unique mother/daughter relationship. Recommended to fans of women's fiction as well as readers who appreciate stories about dysfunctional families. Wow, what a story. This sounds so good!